Sunnyside Farm vegetable CSA runs from mid-May until November. Now, in January, we are preparing for those days! 40 yards of compost was delivered yesterday. That's a tractor trailer full. 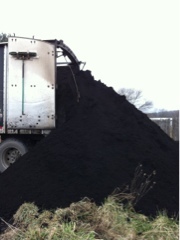 Each year we add to our vegetable beds from our own on farm compost as well as from this hot, steaming pile of fun! The distance from the front of the farm where this is unloaded is not too far, until truck load by truck load, this 40 yards is moved. Which is why we take delivery now, this takes a while to do! 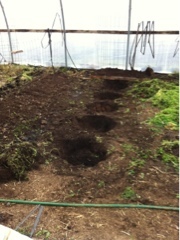 Holes are dug in preparation for tomato plants. 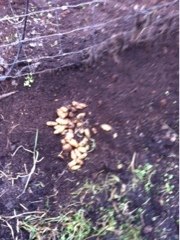 The soil is removed and will be refilled with fresh soil, as tomatoes are heavy feeders. Last growing season additional compost was added a couple of times through the summer, that will be done again this year. So it starts now, with seeds here, soil prep, seed starting, weed pulling (there's always that!! ), seedling transplant. We are still eating greens from inside the hoophouse. Yesterday we had potatoes with spinach and eggs. The potatoes were roasted in the oven a week or so ago (about 5 pounds all at once) and then used a bit at a time. Yesterday the potatoes were diced, reheated in the oven with a bit of spinach and cheese on top and an over easy egg on that. A bit of beef on the side. We have heard that breakfast should be the big meal of the day, and it is here!